Guys, I love Philippa Gregory. I have never read a book by her that I didn't enjoy very much. Until now. I cannot help but feel that this novel was just sort of... boring. Philippa Gregory always makes history come to life for me and manages to make me be on the edge of my seat, rooting for things I know can't be, because hey, it's history and it can't be changed. And I expected this to be so for her YA series as well. 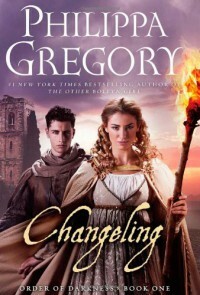 But I feel pretty lukewarm about Changeling. We meet both Isolde and Luca, and well, they are probably the least interesting characters in this novel for all of them being the main characters. Pretty boy meets pretty girl and sort of falls for her, even though he said vows of celibacy, OOPS! Beside that Luca was pretty smart, I didn't really care much for him. Both of their 'sidekicks', Freize and Ishraq are SO MUCH MORE interesting! Freize has a way with animals that's just beautiful and he's all mysterious and funny and I totally liked him! And Ishraq is a strong, loyal woman who I'd love to have as a friend. She knows about medicine and fighting and is just a take-action kinda person. I liked it. I expect much more entertainment from them than from the main characters. Mostly, my complaint is that nothing much happened. Or, well, their were 2 mysteries that are solved by this motly crew, but I never felt any urgency at solving the mystery and the solution to the second one was kinda lame. I mean, I know people didn't know everything we know now, but seriously, that was kinda... stupid. I sincerely hope that this book just suffered from being the first in a series and serving as build-up and that Philippa Gregory will step up her game in the next book, like she normally does, and that there'll be intrigue and romance and just all of those good things I come to expect from her books, because frankly, this was a bit disappointing.